**Please be advised that in placing this order for custom manufactured merchandise you are accepting full responsibility for the correctness and accuracy of all pertinent ordering information. Further, be advised that by proceeding with your order you are affirming the correctness and accuracy of the information contained herein and authorizing Plattsburgh Spring, Inc. to bend or order this custom merchandise. 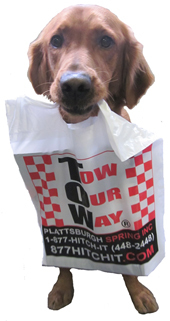 Once you proceed, the purchaser assumes full responsibility for paying for the custom merchandise and no refund will be issued unless it can be shown that any errors or defects were the fault of the manufacturer or Plattsburgh Spring, Inc. and not caused by erroneous information. As a rule, special orders cannot be canceled once the order is placed. Prices are also subject to change, and we reserve the right to cancel any order. 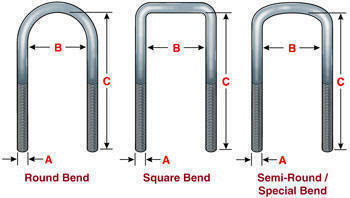 4 - If you select a square bend, you will need to add 3/8" to your total rod length. Deep Nut Thickness: 1/2" - Flat Washer Thickness: 1/8"